Test WiFi station upload throughput. 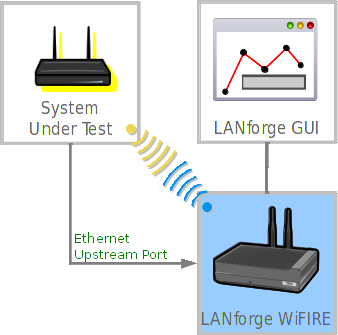 Test WiFi station upload throughput with various numbers of stations. This example uses a pair of LANforge CT520 systems, but the procedure should work on all CT521, CT522, CT523, CT525 and similar systems. Encrypted throughput (WPA2) will perform better on the CT523 and higher systems because their CPUs are more powerful. 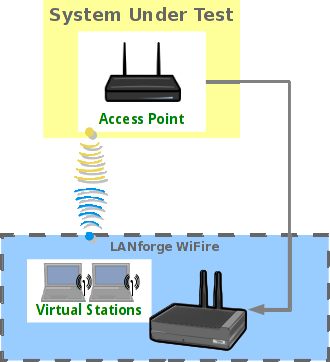 This test assumes you have already created a virtual AP on system 1 and configured it to act as a router and give out DHCP. 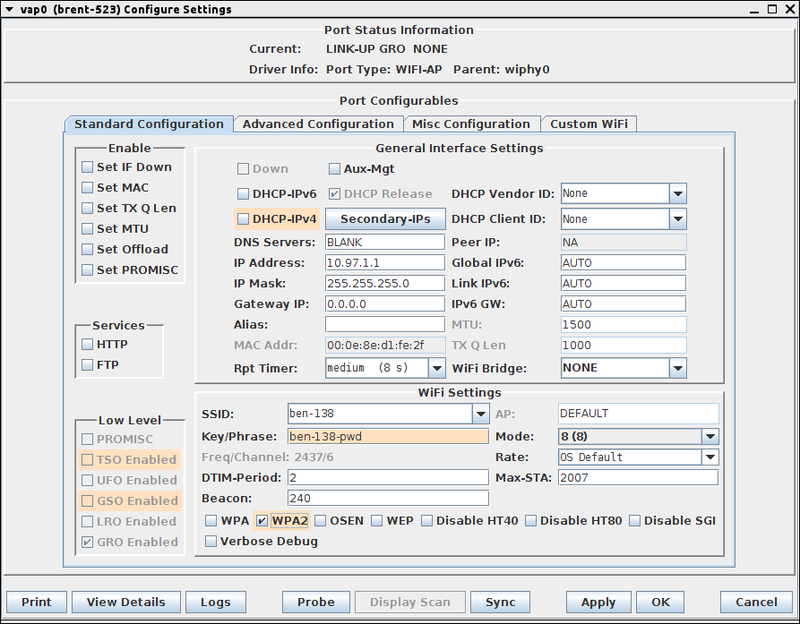 Go to the Port Manager, select the wlan0 interface on the second system, and click Modify. Set the SSID to match the VAP on system 1. Go to Layer-3 tab and click Create to build a TCP connection. Select the Protocol, ports, rates, PDU sizes, Send & Receive buffer sizes. Start the test by selecting the tcp-se row and click Start. 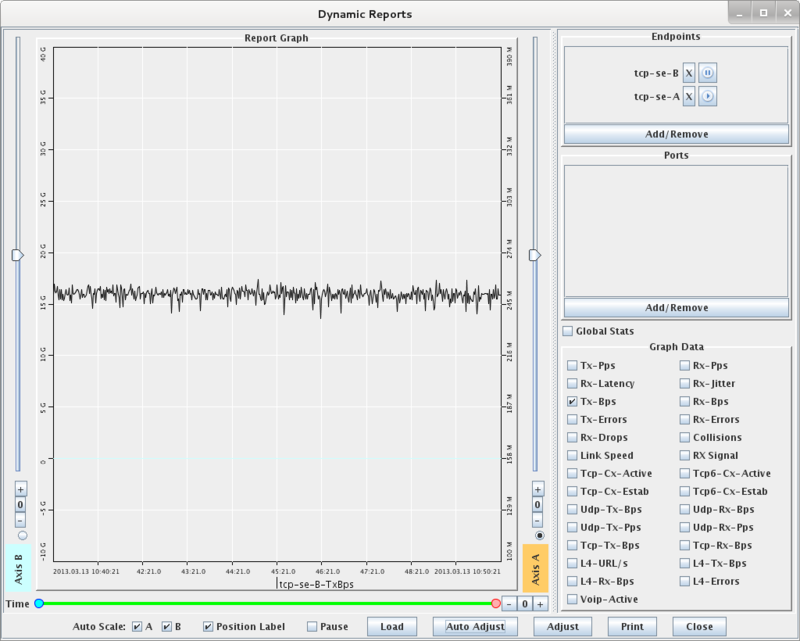 Right-click and select Dynamic Report to get a real-time graph of the throughput. We see about 250Mbps of TCP throughput. 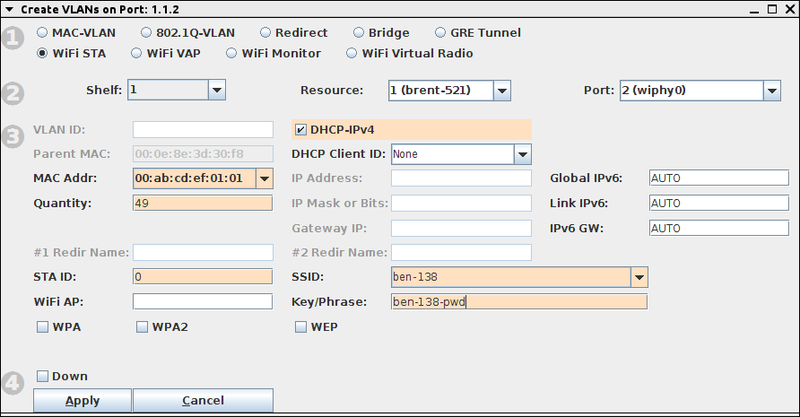 Configure wlan0 to use the same settings so it can connect to the VAP using WPA2 authentication. Go to the Layer-3 tab, start the tcp-se connection, right-click and select Dynamic Report to get a real-time graph of the throughput. We see about 43Mbps of TCP throughput. 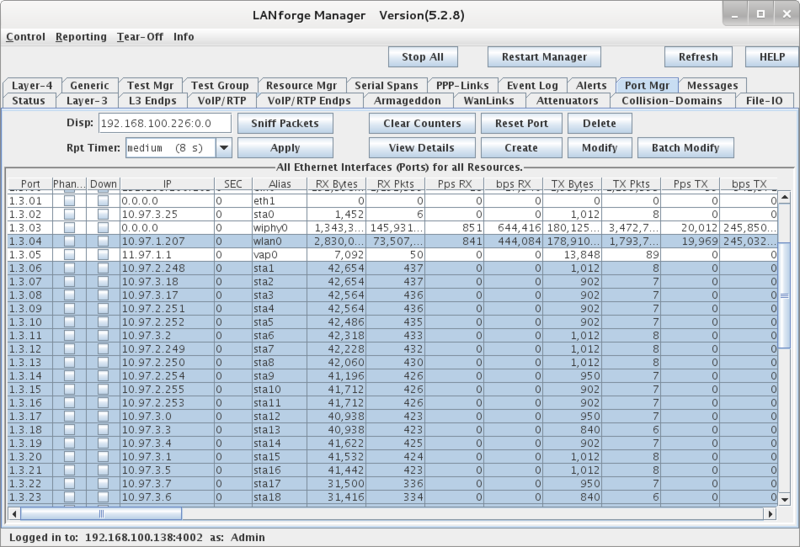 LANforge currently does the WPA encryption in software on the CPU, so it is much slower than un-encrypted traffic. 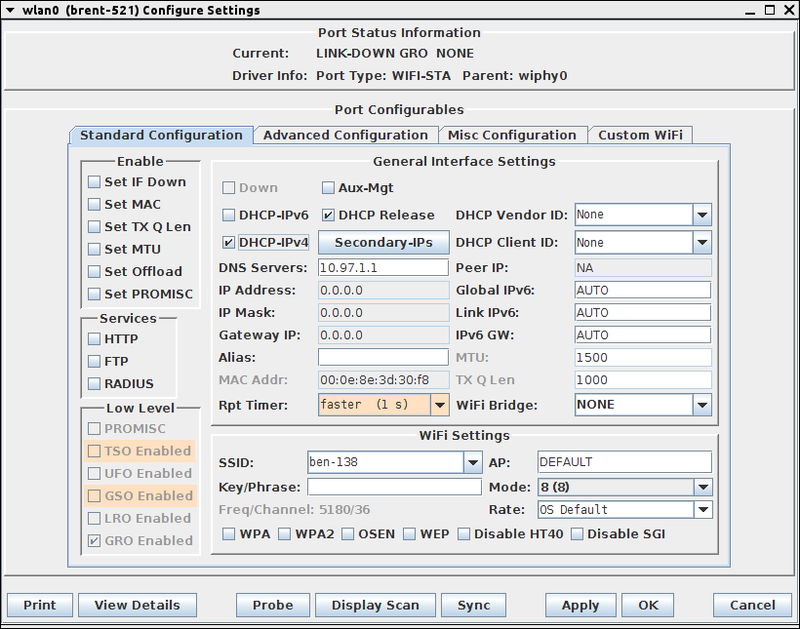 Go to the Port-Mgr tab, select the existing wlan0 and vap0 interfaces, click Modify, un-select WPA2 on each of them, and click Apply. 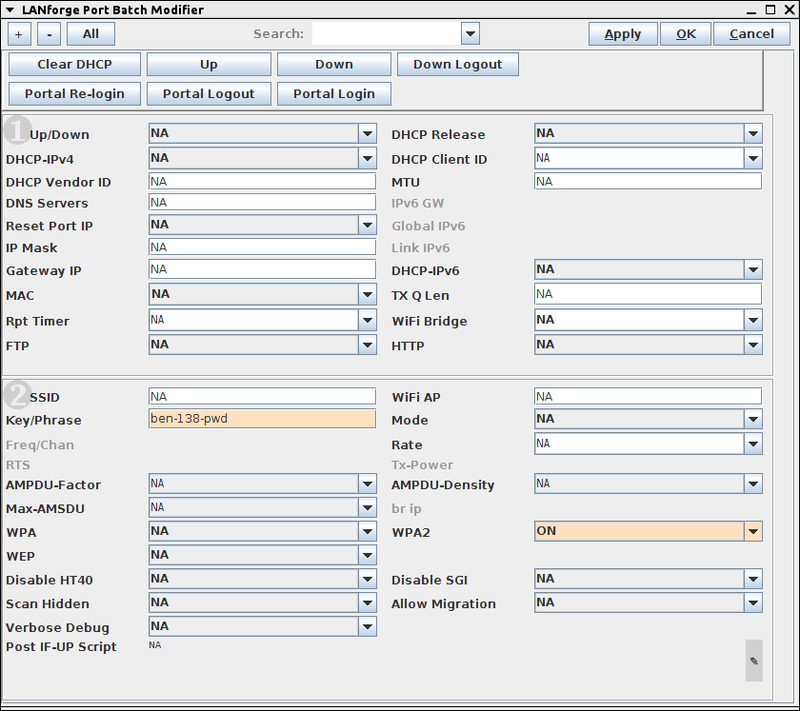 This changes wlan0 and vap0 back to Open mode. You should now see all 50 stations associated with IP addresses. Go to the Layer-3 tab, modify the 'tcp-se' connection. Change the name to tcp-se-0001, and change the RX Endpoint side's port from wlan0 to sta0. Click OK to create the new connection. Now, create 48 more copies. 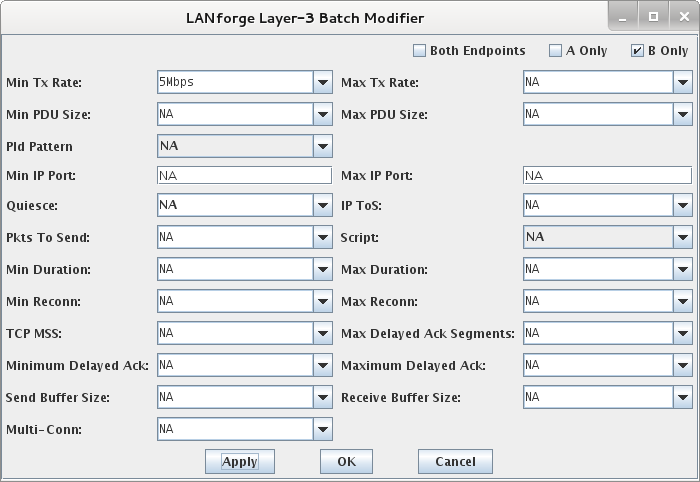 Modify the tcp-se-0001 connection and click Batch-Create. Set quantity to 48, and Port Increment A to 0. Click Apply to create the 48 TCP connections, one on each of the 48 stations. Go back to the Layer-3 tab and view the running connections. 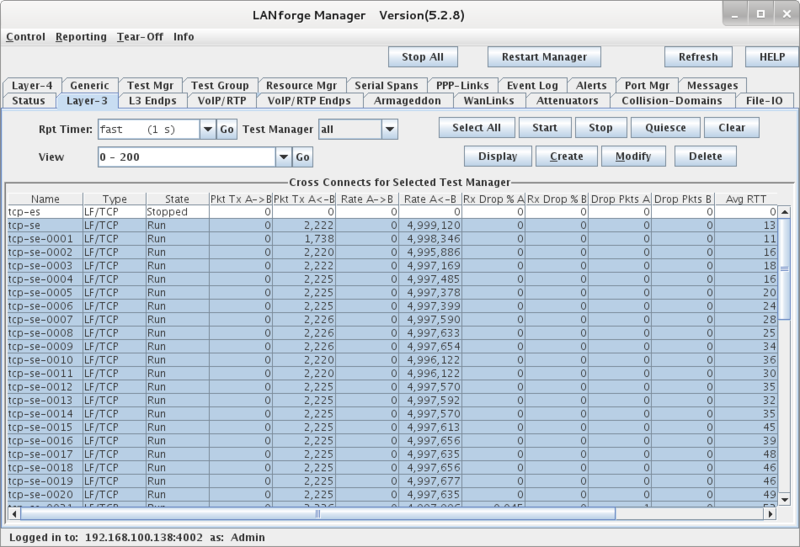 Determine total throughput: Select all of the running connections and then Right-Click and select Calculations. In this scenario, we see about 230Mbps of total TCP throughput. Modify the VAP and stations to use WPA2 instead of being open. Go to Port-Mgr tab, select vap0, and all of the stations and click Batch Modify. Change WPA2 to be 'ON' and enter password in the Key/Phrase box. Leave all othe values set to 'NA' so they are not changed. Go back to the Layer-3 tab, select all of the connections, and click Clear to clear the counters. 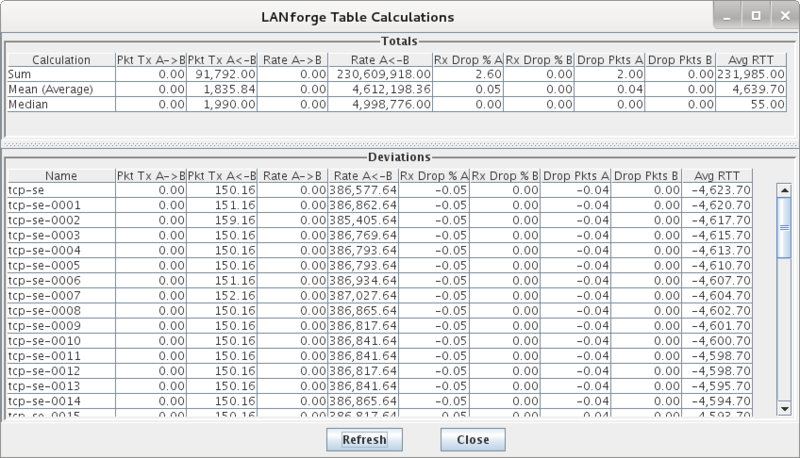 Right-Click and select Calculations to view the totals. In this scenario, we see about 50Mbps of TCP throughput. Use similar steps to those described above to create 78 more stations. In the Create VLANs window, use STA ID of 49 and Quantity of 78 this time (since stations 0-48 have already been created). 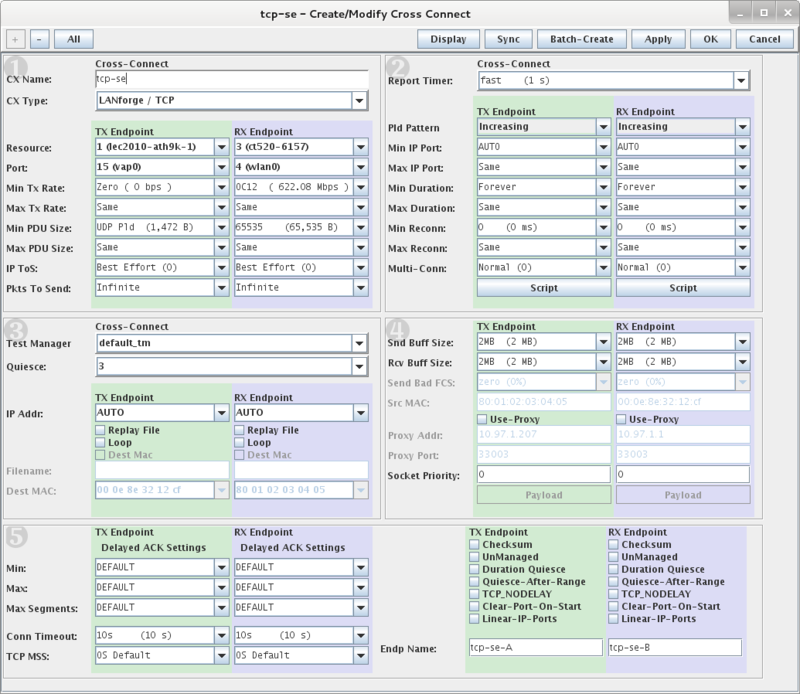 When creating more TCP connections, you can click Modify on the tcp-se-0049 connection and click Batch Create. In this scenario, we see about 36Mbps throughput with TCP in WPA2 mode, and 28Mbps to 40Mbps in Open mode.